According to recent statistics, about 600,000 deaths occur in USA because of heart disease or a condition due to heart disease. To let the gravity of that fact sink in, one must realize that that’s 1 out of very 4 death cases in America. Scaling that factor globally, heart disease kills off more people than terrorism and war combined every year. Men are more likely to suffer from heart disease as compared to women. Out of all heart related disease, Coronary Heart Disease is the deadliest kind of heart disease killing off more than 370,000 people annually in USA. Every year about 735,000 Americans have a heart attack. Of these, 525,000 are a first heart attack and 210,000 happen in people who have already had a heart attack. According to experts, heart disease is often referred as damage to your heart or blood vessels by atherosclerosis which is basically deposition of fatty plaques in your arteries. Plaque buildup solidifies and stiffens artery walls, which can hinder blood flow through your arteries to your organs and tissues. Atherosclerosis is most common cause of cardiovascular disease. It can be triggered by problems which can be controlled such as an unhealthy diet, lack of exercise, being overweight and smoking. In light of all these issues, many drugs have been developed to combat the effects of heart disease. These prescription drugs help with issues like problematic blood pressure and stressed cardio vascular system. These high potency drugs do help to inhibit some of the effects of the disease, and help the patient to keep their blood pressure in check. But, an additional cost of these medicines are their numerous side effects that cause both temporary and long term damage to the bodily functions of human beings. In light of all these problems, our company developed PressureMDRX™ to help support a healthy heart. 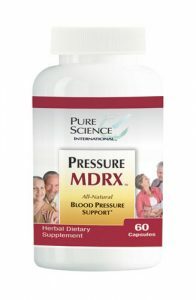 PressureMDRX™ is formulated with a broad spectrum of heart healthy herbs, such as Eucommia ulmoides and Uncaria rhynchophylla, to help balance blood pressure and maintain heart health. Maintain healthy levels of good cholesterol and helps eliminate bad cholesterol from the body resulting in a lower chance of heart disease. Gastrodia (Gastrodia elata): this herb aids in increasing coronary and cerebral blood flow and normalizes peripheral blood pressure. Uncaria rhynchophylla: has been used for centuries in traditional Chinese medicine to treat hypertension. Prunella vulgaris: has been used for regulating blood pressure in oriental countries. Chrysanthemum indicum: helps normalize blood pressure; enhances the respiratory system. Apocynum venetum: helps enhance the cardiovascular system by regulating myocardial contractility and normalizing blood pressure. Eucommia (Eucommia ulmoides): helps regulates blood pressure. Sicklepod (Cassia obtusifolia): helps regulate both blood pressure and serum cholesterol levels. Rauwolfia yunnanensis: has been used in traditional Chinese medicine to normalize blood pressure. This entry was posted in Article and tagged blood pressure, cholesterol, heart desease, heart health. Bookmark the permalink.